By the light of your wisdom and virtue, O holy father, Simeon, the spirit of God revealed you as a true shepherd of Salonica and a divinely inspired master of the mysteries of grace. Because of this, we look upon you as a teacher sent by God himself, and in our joy we exclaim: Glory to Christ for glorifying you. Glory to him who crowned you. Glory to him who gives us grace through you. The point of the troparion is to highlight Simeon’s gifts of being a shepherd and a teacher of the divine mysteries. Gifts we ought to beg the Holy Spirit to bestow upon us. The faith community is desperate to have great shepherds and teachers again! Yet, St Simeon has often gifts we aspire to live by. A New Skete hagiographical sketch of the archbishop says thus. “Simeon was a native of Constantinople, where he also became a monk. In 1416 he was made archbishop of Thessalonica. During most of his episcopate, the city was under a vise-like threat from Venetians on one side and Turks on the other. In those years of turmoil, all looked to Simeon for his pastoral prudence and courage under stress. 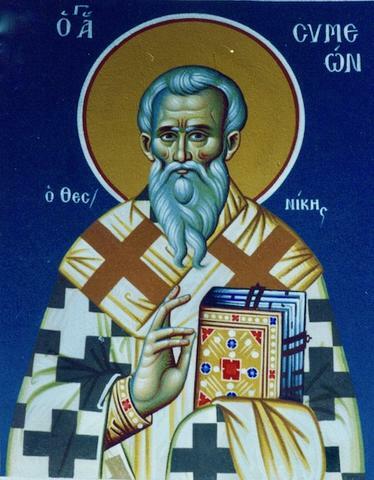 Simeon was a successor to Gregory Palamas in the see of Thessalonica, and heir to his theology, refracted through the humanism of Nicholas Cavasilas: “He was the noblest of the latter’s pupils. Simeon never claimed to be a mystic himself, but like his master, he believed that the highest mystical experience was to be found in the liturgy. And though he argued against the Latins, he clearly longed to reach an understanding with them. His peacemaking attitude and compassionate administration made him so well loved in his diocese that when he died, six years after the city had been sold to the Venetians and four months before it fell to the Turks, not only did the Italians mourn him along with the Greeks, but the Jews, a race that seldom had cause to love Byzantine hierarchs, joined sincerely in the mourning. From Simeon’s writings we have descriptions of the last use of the cathedral rites of Byzantium, which in his day had been replaced in Constantinople herself by Palestinian monastic forms. While the archbishop lamented the change, he made practical pastoral adjustments in his own churches to accommodate the new forms. In addition to his liturgical works, his writing spanned political, historical, canonical, dogmatic, apologetic, moral, and pastoral themes as well. He may be considered the last true theologian of the Byzantine period. After his death in September, 1429, he was revered by many as a saint. But, perhaps because of the centuries of Turkish occupation, it was not until modern times that he was officially canonized. This occurred in his own cathedral in Thessalonica in 1981.